I've had it with today's modern footballer. It's no longer enough to get injured at the drop of a hat, vacation in Ibiza, or be photographed dancing on bars while doing shots of tequila. No, to be a true modern player these days, one must have the signature piece of equipment of today's pampered star: the snood. farlieonfootie's been outspokenly against this horrific trend going back for some time now -- at least two weeks. The time has finally come, though, to call out some supposed stars on this affront to both our game and manhood. What ever happened to being a real man, playing a tough, "stuck in" game, and having a cold beer afterward? Many of the players out there today look more appropriately attired to attend womens' fashion shows, do Red Carpet interviews, and wind down with a double-espresso, half-caff latte, with a pinch of non-sucrose sugar and a slight twist of lemon. And how appropriate is it that no team in the EPL exemplifies this detestable look better than farlieonfootie's favorite whipping boys: Man City. Let's take a look at just a few of the massive "stars" on display at Eastlands today versus Bolton: wimpy Yaya Toure was bundled up in an extra large, relaxed fit snuggie, while softie Carlos Tevez joined in his signature slim-fitting, streamlined snood. Completing the resplendent triumvirate was Italian pretty boy Mario Balotelli, with his medium-sized, standard fit neck warming scarf. In fact, City like the pampered look so much that the club has started officially endorsing it by selling MCFC branded snoods online (I'm not making this stuff up, folks. I report the news, not invent it.). I date the whole horrible snood trend back to the arrival, a year ago, of another pretty boy Italian to the sidelines at Eastlands. Sure, I get that Italians like fashion, and tend to dress well. I even understand -- kind of -- Carlo Ancelotti's signature black-on-black look. He thinks it's cool, and even though he's wrong, I get it. But Mancini took the "fashion" thing in football to a whole new level with the fancily-knotted scarf he wore virtually all last season. It's too bad he doesn't coach at the international level, because it would be interesting to see if he'd show up in Qatar wearing a scarf, so common has the accoutrement become for City's fashion boy dandy. His natty attire, often including just a blue and white scarf tied neatly over a well cut Armani suit, has become a common sight at EPL games, even those being played on ostensibly hot days. This isn't the way real coaches dress. Did anyone see Fergie at West Ham mid-week? Easily spotted through the dumping snow due to his being red with rage, the Scotsman was bundled up in a down jacket with a hood, and a red wool cap. He looked cold, but he looked like a real man, not a pretty boy. Or how about Bolton's Owen Coyle today? Although the temperature was close to freezing, Coyle wore shorts and a sweatshirt on the sidleline. That's old-school stuff, and it's cool. It's the damn-the-cold-I'm-not-letting-it-bother-me look. 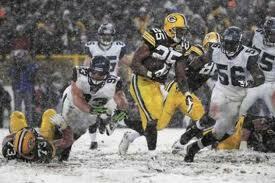 And if anyone thinks that doesn't work, take a look at the NFL photo below . Despite the snow, notice the number of short-sleeved jerseys. That's how real men roll. Not a single snood in sight, even in the stands. But if you're led by a pretty boy, and you have a team of high-priced, overly protected stars, it's a quick step down to the gloves. And from the gloves we've evolved even more quickly into hats and snoods. And that's my point: we're on a slippery slope, and where is it all going to end? Just where do we draw the line and Just Say No? Lately I've even seen tights --tights, for God's sake! -- on the EPL pitch, in addition to gloves, hats and snoods. I thought only Spanish players wore tights. It's a wonder no one on City has thought to bust out the sideline down jacket or snow pants for a game yet, although surely that's coming. Farlieonfootie is a snood-free zone for December 5th and every other day, except for our European correspondent Todd, who is often seen walking around corporate headquarters with a sweater draped nattily over his shoulders. Although he swears he doesn't own a snood, the doubts still linger. Game Day Beer Review: Brouwerij St. Bernardus NV Christmas Belgian Abbey Ale (10.0% ABV). Pours a dark, Coca-Cola brown with a one fingered, creamy head that lingers on and on. Nose is full of sweet malts and dark fruit. The taste is a velvety smooth mix of malts and fruits, highlighted by a strong Belgian yeastiness. St. Bernardus is thisk, and has a highly carbonated mouthfeel. Drink the Christmas legend: A. This is hilarious!!! Snuggies and snoods are really so stupid. So I'm thinking you don't want that United snood I got you for Christmas this year. I'll tell Correspondent James to return the tights as well. I remember when everyone wore a thneed. It used to be "you need a thneed!" But then that stupid Onceler cut down the last Truffula tree and now no one wears a thneed. It's all snoods. I'd rather be caught with a star on my belly than wearing a snood!